The Road Venture SAT is an innovative light truck and SUV tire that combines exceptional all-season traction with superb comfort. The SAT is the perfect first replacement tire for your vehicle�s original equipment. Ideal for the active family that drives mostly on highways and city streets, but still needs off-road capability on soft turf, packed sand and light gravel. The SAT also earns the Severe Snow mark, certifying snow traction performance equivalent to a dedicated snow traction tire. Kumho patented ESCOT casing technology diminishes the concentration of stress on every cord edge of the tire, and ensures a uniform contact patch with the road surface. 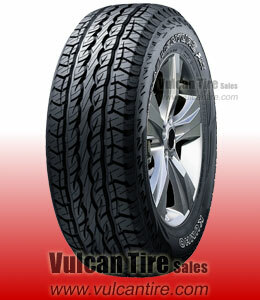 Tread compound offers a wide operating temperature range and all-around performance with outstanding winter traction. 5-rib design is complemented by cross and lateral grooves for efficient water evacuation. Straight, center rib block improves steering response and stability, and helps maintain low noise operation. 3-D tread block edge prevents snow build-up in tread, and contributes to longer, more even wear. excellent tire a big improvement over the tires that were on it when I bought it. they make my truck handle and drive much better.